When you remake a much-loved film, you have one substantial structural problem: the audience knows exactly what’s going to happen. When you remake A Star Is Born, which itself was a remake of a remake, your audience is so far ahead of you that it’s almost behind you. As Lady Gaga leaves her lousy restaurant job at the beginning of the film and walks up a ramp, singing to herself, we know, even if she doesn’t, that she will soon meet an ageing and alcoholic rock superstar, that they will fall in love, that her extraordinary talent will become clear to all, that she will rise and rise, that he will fall and fall, that she will supersede him and that their love cannot and will not last. Her destination is clear. But what’s the journey like? Happily, this 11th or maybe 12th version of A Star Is Born is hugely enjoyable, although I was struck while watching it that, if it were anything even slightly less than that, it would be a disastrous and catastrophic failure. Bradley Cooper, who plays the ageing, alcoholic rock superstar, also directs for the first time, so confidently and with such skill that it looks as though he’s been doing it for years. But it’s Lady Gaga who is the revelation. She is not (I’m assuming) a trained actress and, to some extent, she is playing herself – although many of the great screen stars of every age have done that and no one has complained. But she carries the film’s emotional heft like an old pro. Last time around, in 1976, Barbra Streisand played the ingénue and Kris Kristofferson the old geezer. (In fact, he was only six years older than her.) Barbra was too knowing and Kris was underpowered. Who else could have played these roles since? Imagine Madonna in a 1988 version, with her weedy little voice and utter inability to act, and wake up screaming. The real surprise, to me at least, is what an astounding singer Lady Gaga turns out to be. I clearly haven’t been paying attention, for she has serious pipes. The entire film rests on a particular scene, when he is performing at some outdoor stadium gig and he starts singing a song she has written, and he invites her onstage, and she refuses, and she can’t do it, and then suddenly she decides she has to, and she strides out on stage, grabs the microphone and lets rip. If that scene doesn’t work, the film fails. It really works. If I have a complaint, it’s that this scene appears about a third of the way through the film, and there are hours of story to be got through before you can finally go to the loo. An elderly couple two rows in front of me were literally vibrating with pain by the film’s end. Also, for a hopeless alcoholic, Cooper is remarkably gym-toned, and has exceptionally good teeth. Moreover, the music Lady Gaga plays when she becomes a star seems facile in the extreme, although I suppose it does resemble the terrible music she perpetrates in real life. But, overall, this is a fine, intelligent and emotionally believable film, with some good secondary performances from Sam Elliott as his older, more laconic brother, and young Rafi Gavron as her nasty manager. 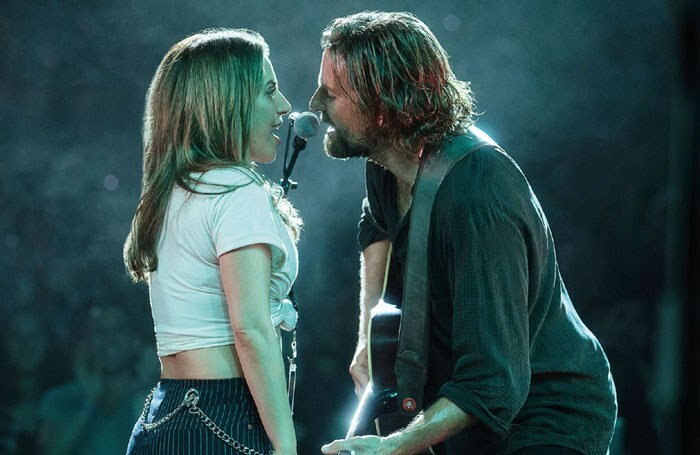 The final scene, a new song written by Cooper’s character and sung by Gaga’s, is wonderful and, like all the music in the film, recorded live. I left with a smile on my face and a manly tear in my eye, breaking into a small sprint for the gents.